Cornmarket Group Financial services is one of Ireland’s largest insurance brokers, and provides insurance services to public sector employees. Púca was chosen as the digital development and UX partner by Cornmarket to develop both the web-based customer portal and corresponding native iOS and Android mobile apps. The objective of the ‘MyCornmarket’ project was to create an integrated, customer centric experience comprising a responsive web portal and native mobile app across iOS and Android platforms. The project introduces a new customer touch point that positions MyCornmarket as the customer’s primary point of contact with Cornmarket. The project is expected to greatly reduce call centre volume and also allow Cornmarket to upsell related insurance products to consumers. The mobile app and web portal provides full self-service facilities and allows customers to access the information that is most important to them at any time, wherever they are, without being restricted by Cornmarket’s office hours. We designed the application following best practice in User Experience (UX) for mobile app and web development. 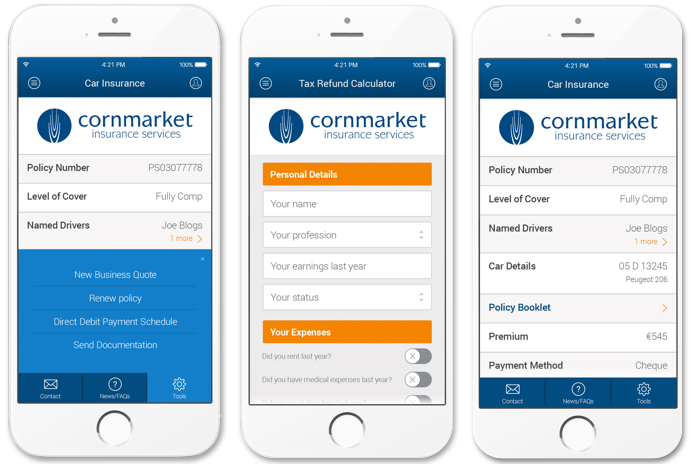 The Cornmarket app and web portal is sleek and easy for users to navigate, increasing user engagement and encouraging repeat visits. The application is integrated with Cornmarket’s backend systems via a REST API to deliver a dynamic, personalised experience to all users. The website is responsive, ensuring the best user experience irrespective of the device used to access it. The mobile apps are built using the native iOS and Android SDKs with some shared elements presented using HTML5. Cornmarket use Púca’s in-house push notification platform to communicate with users about upcoming payments and related offers. End user feedback has been very positive to date with the application achieving its purpose of providing a slick, integrated user experience across both app and web channels. The project cements Púca’s position as the development partner of choice for secure, multichannel, self-care applications in the Financial Services, Utilities, Telecoms and Retail industries.